ERP is an acronym for Enterprise Resource Planning that has been known to be the backbone of many corporate-scale businesses. Generally, most of the large companies look for major players in the market like SAP, Oracle, Microsoft Dynamics etc. Their offerings are comprehensive, but at the same time expensive in licensing, implementation and maintenance perspective. What happens if your business can’t afford one of those gigantic implementations or if your needs are simple for the bigger outcomes? You turn to the open source ERP alternatives. Or you look for a more economic solution. In short, Open source ERP is the software system whose source code is made public and open for all. The open source model allows organizations to access the ERP system’s code and customize it using their own IT department instead of paying extra bills for vendor customization services. Now the question is how to decide which open source ERP best fit your business? Whether the implementation process of your chosen ERP is easy and hassle free. The main reason companies choose open source ERP systems is because they are economic and easier to customize. Further, it saves your business costs in the long run. When an open source ERP is used there are generally no license fee or software maintenance costs. In many cases, the external consultants and programmer fees are comparatively lower. Most open source ERP software systems can use open source databases and operating systems, giving you a license-free option. On the other hand, commercial ERP systems often need expensive commercial databases and operating systems which is not so budget friendly at all!! In most of the cases, when you implement an open source ERP system for your business, a new interface shell will create outside of the core ERP system to meet the needs of your business. So that the core ERP system could line-up with your business needs. With commercial systems, the existing interface pattern is fixed which makes the customization process complex. Another big reason that open source ERP is used because you own the system with its full content. Additionally, there is no lock-in or dependency on the vendor, and you are more independent on how you are going to implement the software (of course if you have the necessary IT support). Most of the mid to large sized companies IT department welcome an open source ERP that has a higher quality, because many independent, often passionate developers have looked at it, criticized its source code, and contributed to its enhancements. Competition between developers is very common in this sector which improves the quality of open source software systems. 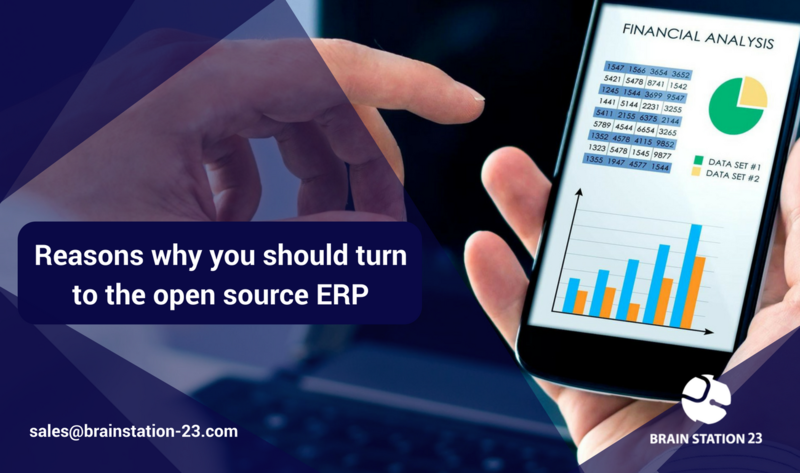 When it comes to the matter of upgradation, open source ERP systems are easier and simpler to upgrade than any commercial ERP systems. Open source ERP systems upgradation could be more often (every three months to monthly) without interruption of the main production system. Now let’s put some light on a wonderful open source ERP software that we’ve been providing to our customers to level up their game. Odoo is one of the leading open source ERP software that has been in the market for last 12 years. Odoo’s powerful and easy integrable ERP system enables interactions of marketing, sales, quality control, products processes, supply lines, stocks and many other areas within a single database. For its consistent stability and regular updates for the clients, Odoo has become one of the reliable open source ERP in the market. This flexible platform also make the customization process easy for its users, even if they have the least technical knowledge on this platform. Additionally, Odoo has a 3 million user-base and a big active user community to share the knowledge among its users and developers. Odoo is one of the budget friendly web-based ERP tool. Subscriptions to individual modules will set you back per user into $6 (USD) per month for each one. New customers get a discount on the initial number of users purchased. If you install extra applications like FedEx, eBay, USPS, your charges will be different. Find more about the pricing here. If you want to easily customize the system based on your needs, save substantial amounts of money, and avoid vendor locked-in, the choice is easy: go open source. You can give Odoo a try before you decide to sign up. You can also download it or grab the source code from GitHub. If you don’t have the IT support to customize your Odoo open source ERP, feel free to ping us. Brain Station 23, has been known as one of the best software companies in Bangladesh working on Odoo implementation and customization and recently updated our partnership with Odoo. To know more about our offerings, visit our website.